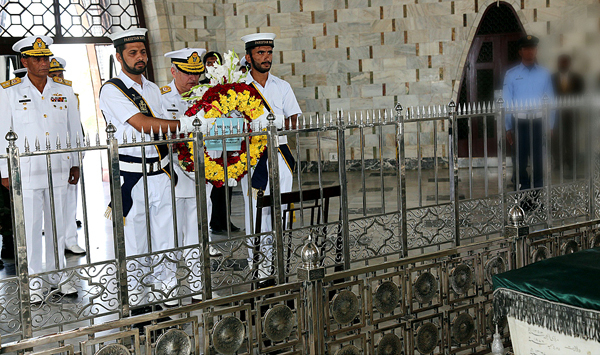 KARACHI, Oct 12 (APP):To pay homage and reverence to the founder of Pakistan, the newly-appointed Chief of the Naval Staff Admiral Zafar Mahmood Abbasi visited mausoleum of Quaid-i-Azam Muhammad Ali Jinnah at Karachi on Thursday. wreath, offered Fateha and recorded impressions in the visitors’ book, stated a statement issued by Pakistan Navy’s media wing. mausoleum of the Father of the Nation, whose golden principles are the beacon of light to guide the nation in overcoming confronting challenges. The Admiral was accompanied by Commander Karachi, Rear Admiral Ather Mukhtar and other officials of Pakistan Navy.